My mom's Peace rose is in bloom. And, yes, it's the same rose above -- at different stages of development. It's like the rose has several wardrobe outfits in various hues and shades as it matures from bud to opening blossom to full bloom. Doesn't that seem amazing? No wonder we're dazzled. The Peace rose has a very special place in history. Its actual name is 'Madame A. Meilland'. I found a very nice article about who developed the rose and how it became so famous. 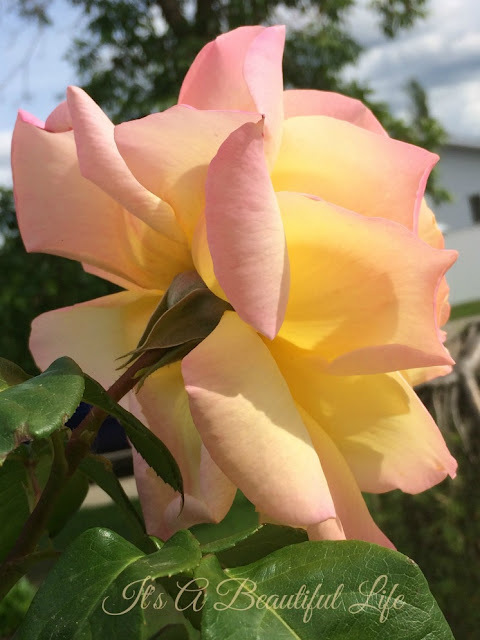 Although I can't imagine anyone not knowing about this lovely rose, if you have not heard about it, you will enjoy reading its lovely story here. I just went out and took photos of the blossoms that are open today ... her gorgeousness up close. Aren't you glad for eyes to see such exquisiteness? And her fragrance is like a whisper -- one must lean in close to catch the scent. The way a woman's perfume ought to be, not overwhelming, just a hint on the breeze ... soft and sweet and intimate. Wishing you a glimpses of heaven in unexpected places. Beautiful rose! And I'm amazed at the color variations as it blooms along. Thank you for sharing, Bren. I have a beautiful Peace rose in the garden, and never cease to marvel at its changing hues. What a gorgeous rose and I love the way you described the fragrance, comparing it to a lady's perfume. 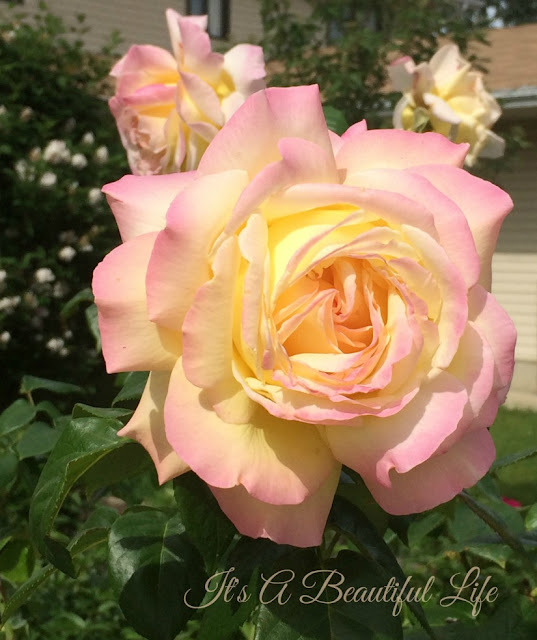 Both my mother and my MIL had these roses....just stunning, simple beauty. Have a blessed weekend! The roses have a lush, sweetness in every fold. I love the roses and your photos. My goodness that rose is gorgeous. I loved the way you describe her as a lady with several wardrobes. Marvelous! A lovely post about a beautiful, beautiful rose. I have always loved the story of the peace rose and think of it every time I see her. I don't have much space in my garden, but I may try and find a spot for this beauty. So pretty! I've always been partial to yellow roses. Oh what a beautiful rose Brenda. I used to have a Peace Rose and so did my Mom. Unfortunately as often is the case they get froze out in the winter. Seeing yours makes me want to go out and find another. Thanks for sharing. Hope you are having a delightful day. Brenda, I love roses and those are just gorgeous. These roses are absolutely heavenly! I had Peace once upon a time, but no more. Does yours have a fruity fragrance like mine did? Just loved that scent and the color combination!